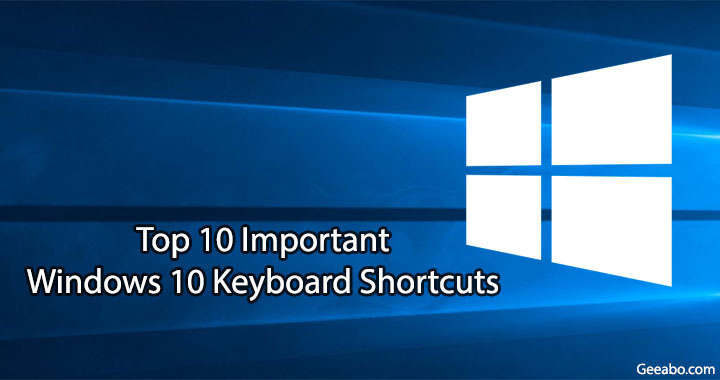 This article of Geeabo teaches you about the Top 10 Important Windows 10 Keyboard Shortcuts. In compare to windows 8, Windows 10 is far better and because of their some important windows shortcuts keys. If we talking about Windows 10 Keyboard Shortcuts then there is almost hundreds of shortcuts but you can not use all these shortcuts in you daily life. So, In this article I will tell you about some very important Windows 10 Keyboard Shortcuts which you can use in your daily life. You can make your everyday activities easier by using these keyboard shortcuts in your Windows Pc. But for this you must have to know about some basics of computer. This keyboard shortcut helps you to open Windows File Manager immediately instead of going to the file manager icon or My Computer icon and then double click on it to open. #2. Ctrl + Shift + N.
By using this keyboard shortcut – Creating New Folder in your pc is quite easy. If you want to create a new folder in your desktop area then simply Click “Ctrl + Shift + N” and it will create New Folder. For Selecting all the files, folders, etc. from where you want to select, you can use this “Ctrl + A” shortcut. This keyword select all the things at once. #4. Ctrl + Shift + Esc. For opening windows task manager you use either windows menu or toolbar but it takes more time. So, for opening windows task manager quickly you can use “Ctrl + Shift + Esc” keyboard shortcut. In emergency case if you have to turn off your pc then either you press power key of your Pc or you directly switch off your main light. But this can harm your pc. So, in this case you can use “Windows + L” shortcut to lock your computer’s screen instantly. #6. Ctrl + C and Ctrl + X. Normally, when you copying or cutting something in your computer then you select the file then right click on it then click on “Copy” or “Cut”. But you can do this thing very easily and quickly by using “Ctrl + C” for copying and “Ctrl + X” for cutting. This shortcut is used to paste something from one folder to another or one drive to another drive that you copy or cut from somewhere. This keyboard shortcut is very important and almost every users uses this keyword “Alt +F4“. This is used for closing the open window one by one. If you open a lot of window in your pc and now you want to come to your desktop window then it is very hard to minimise each window one by one and it also takes more time. So, Click “Windows +D” to minimise all the open window at once and come to the desktop window. Normally, When we trying to open windows settings then we go to start menu and search for settings and then click on enter. But it takes time. So, you can use “Windows + I” to open settings easily and quickly. So this was my Top 10 Important Windows 10 Keyboard Shortcuts for save your time. Hope you guys like this article about the Top 10 Important Windows 10 Keyboard Shortcuts and you have learned something new with the help of this article. Please Do Like, Comment and Share our articles if you really appreciate my work.